What do you see when you look at your backyard—a never-ending list of chores, or a private sanctuary for rest and relaxation? If it’s the former, a composite deck may provide the perfect solution for your maintenance issues while improving the value of your home. Our composite decks mimic the look of wood planks while delivering a tremendously rugged performance. A full array of woodgrain styles and colors are available to transform your backyard into an oasis for entertaining. Our composite decks are engineered to withstand anything Mother Nature can throw your way. These decks won’t fade, scratch, warp, or stain. On top of that, they’re environmentally friendly, too. A proprietary composite core is made from recycled wood materials that would otherwise end up in landfills. Because our composite deck are designed to last for decades, it dramatically reduces the wasteful cycle of repair and replacement and eliminates the need for harmful sprays, paints, and sealers. Our line of composite decking spans every style you can imagine. Whether you’re in the market for a deck that captures the rustic elegance of outdoor woods like teak, one that resembles your indoor wood flooring, or one that can handle the heavy traffic of marinas and boardwalks, we have the color and style you’re seeking. 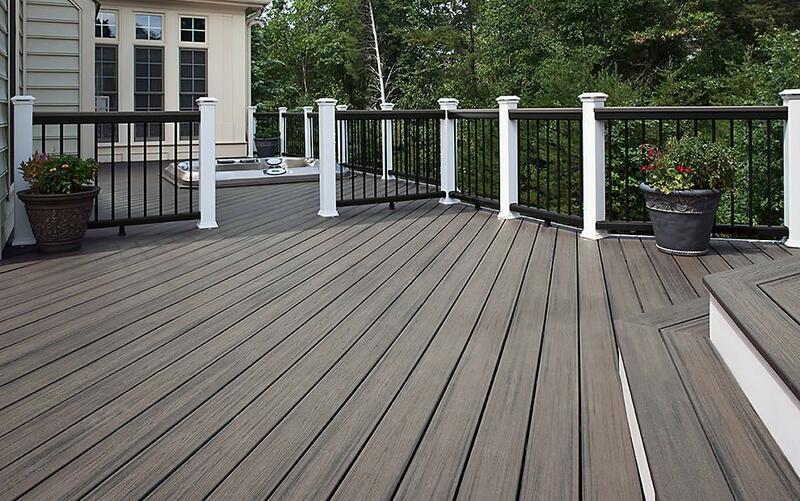 With a composite deck, you never have to worry about painting, scraping, staining, or peeling. Simply choose the color that best suits your style and enjoy it for decades. All of our composite decks are backed by a 25-year limited warranty and are guaranteed against termites, checking, splintering, rot, and decay.